This article is about the comedian. For the film, see The Cable Guy. Daniel Lawrence Whitney (born February 17, 1963), known professionally by his stage name Larry the Cable Guy, is an American stand-up comedian, actor, producer, singer and former radio personality, with a career spanning over 30 years. 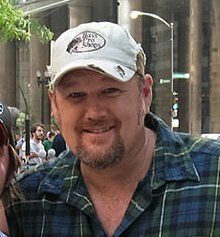 Larry the Cable Guy has released seven comedy albums, of which three have been certified gold by the RIAA for shipments of 500,000 copies and in addition has starred in three Blue Collar Comedy Tour–related films, as well as in Larry the Cable Guy: Health Inspector, Delta Farce, and Witless Protection, as well as voicing Mater in the Cars franchise. Whitney's catchphrase "Git-R-Done!" is also the title of his book. On January 26, 2010, the TV channel History announced that it was ordering a series starring Whitney called Only in America with Larry the Cable Guy, in which he would explore the country and immerse himself in different lifestyles, jobs, and hobbies. The first episode of the series aired on February 8, 2011. The series finale aired August 28, 2013. Whitney was born in Pawnee City, Nebraska on February 17, 1963, where he was raised on a pig farm. He is the son of Tom Whitney, a guitarist, entertainer, and Christian minister, and Shirley Whitney. Whitney attended high school at The King's Academy in West Palm Beach, Florida, in the late 1970s through 1980 where his father was The King's Academy's elementary school principal. Whitney graduated from Berean Christian School in West Palm Beach in 1982. He went to college at Baptist University of America in Georgia, and the University of Nebraska-Lincoln. He majored in drama and speech. He credits his roommates from Texas and Georgia for inspiring his Southern accent impression. He dropped out after his junior year after trying his hand at comedy. Whitney started his career in radio in the early 1990s when he made regular radio appearances on the nationally syndicated program, The Ron and Ron Show, as well as other radio shows such as "The Bob and Tom show" The Chris Baker Show on KDGE and KEZO's The Todd and Tyler Show in Omaha, Nebraska, as well as the Kirk, Mark, and Lopez morning show on WIYY in Baltimore, Maryland. He was also a frequent guest on The Johnny Dare Morning Show on 98.9/KQRC, Kansas City. He also appeared on WJRR in Orlando, Florida. He was brought to New England on Greg and the Morning Buzz on WHEB 100.3 and WGIR-FM 101.1 in Portsmouth and Manchester, New Hampshire, respectively, doing two commentaries a week. Initially performing stand-up under his real name with limited success, he became famous after developing the Cable Guy character, a personality that he now maintains throughout his stage act. The Cable Guy character has a stereotypical redneck appearance and a thick Southern accent, recounts stories about his "family", and uses, among other common expressions, his own catchphrase "Git-R-Done!". He says in interviews and in his autobiographical book GIT-R-DONE that he deliberately "turns on" the accent both on and off stage, because he may forget it if he kept his normal accent intact. He uses catchphrase humor, including "Lord, I apologize, and be with the starvin' Pygmies in New Guinea. Amen" after telling jokes of questionable taste; and, "I don't care who ya are, that's funny right there" after jokes that evoke raucous laughter. Whitney was roasted in a Comedy Central special on March 15, 2009. On February 8, 2011, the première of his newest travelogue series, Only in America with Larry the Cable Guy, was broadcast on the History Channel. A total of 4.1 million viewers, 1.7 million adults 25–54, tuned in, nearly doubling the total for the "Top Shot" season 2 opener. During season two in the episode "Larry Goes To Washington", Whitney was the first on-air talent from a non-news crew allowed in the War Room, also known as the Command Center, as he explained during the program. In June 2012, Disneyland's California Adventure theme park's "Cars Land" features a ride called "Mater's Junkyard Jamboree" that features Whitney's voice as his character Mater from the Disney/Pixar Cars movies. Whitney resides in Lincoln, Nebraska, on a 180-acre (73 ha) farm. On July 3, 2005, he married his wife, Cara. They have two children together: a son, Wyatt (born August 2, 2006), and a daughter, Reagan (born October 29, 2007). His hometown of Pawnee City, Nebraska has a street named after him. Whitney also donated money to buy new theatrical equipment for the local high school. Whitney is an avid Nebraska Cornhuskers football fan. His signature camouflage hat has the University of Nebraska-Lincoln nickname "HUSKERS" emblazoned on it, as seen in the 2007 film Delta Farce. He is also frequently seen with a gold Nebraska "N" on a chain around his neck. On October 1, 2016, in his luxury suite at Memorial Stadium during the Nebraska vs. Illinois football game, Whitney was challenged to an arm wrestling match by an Army veteran and Nebraska Army National Guard member, John O’Connell, who lost the match in less than one minute with his arm (humerus) broken by Whitney. In September 2010, Whitney donated $5 million to the Arnold Palmer Hospital for Children in Orlando, Florida. The gift was for further development of the International Hip Dysplasia Institute at the Orlando hospital. After Dr. Chad Price at Arnold Palmer Hospital for Children helped cure their son, Wyatt, of his dysplasia when he was an infant, Whitney and his wife, Cara, made private donations to the hospital and Whitney raised money through appearances on Family Feud and Are You Smarter Than a 5th Grader?. The hospital opened a new wing called the Wyatt Whitney Wing in May 2012. Whitney is a close friend of contemporary comedian Lewis Black, despite their dissimilar political views, background, and comedic material. Whitney formerly worked as a radio personality on Blue Collar Radio on Sirius XM Radio. A Box set consisting of The Right to Bare Arms, Christmastime in Larryland, and Morning Constitutions. 2009 Are You Smarter Than a 5th Grader? Himself Episode: "3.13"
^ "Larry the Cable Guy gives $5 million to hospital". Retrieved January 5, 2013. ^ "Cara Whitney Biography". Internet Movie Database. Retrieved January 5, 2013. ^ "Larry the Cable Guy". The New York Times. Retrieved June 9, 2011. ^ "History orders Larry the Cable Guy series". Reuters. January 26, 2010. ^ "Only in America with Larry the Cable Guy – episodes". History Channel. ^ "Larry The Cable Guy Biography". Cmt.com. Retrieved June 9, 2011. ^ "For Pig Farmer-Turned Superstar, Life is All About Faith, Family and Football - Huskers.com - Nebraska Athletics Official Web Site". Huskers.com. Retrieved April 28, 2014. ^ "5 Reasons to See Larry the Cable Guy at the Kravis". Archived from the original on December 4, 2014. Retrieved October 7, 2014. ^ "The King's Academy 1980 Yearbook, page 59" (PDF). Archived from the original (PDF) on October 11, 2014. Retrieved October 7, 2014. ^ "The King's Academy 1979 Yearbook, page 63" (PDF). Archived from the original (PDF) on October 11, 2014. Retrieved October 7, 2014. ^ "The King's Academy 1980 Yearbook, page 23" (PDF). Archived from the original (PDF) on October 11, 2014. Retrieved October 7, 2014. ^ "Larry the Cable Guy brings football back to alma mater". Retrieved October 7, 2014. ^ a b William Booth (September 5, 2004). "Guffaw Guys". The Washington Post. Retrieved June 9, 2011. ^ "Comedy Central To Rip More Than Flannel Sleeves – Network To Roast Larry The Cable Guy". Comedycentral.com. May 26, 2011. Retrieved June 9, 2011. ^ ‘Only In America with Larry the Cable Guy’ Premieres to 4.1 Million Viewers; ‘Top Shot’ S2 Premieres to 2.8 Million. Tvbythenumbers.zap2it.com (February 9, 2011). Retrieved on 2012-07-23. ^ Mater's Junkyard Jamboree Archived May 9, 2012, at the Wayback Machine. Disneyland.disney.go.com. Retrieved on 2012-07-23. ^ "Bektrom Foods, Inc.: Larry the Cable Guy". Bektrom Foods, Inc. Retrieved October 3, 2015. ^ Hatt, Elizabeth Louise (January 4, 2012). "Store Brands Stay Strong". Grocery Headquarters magazine. New York, NY. Archived from the original on October 4, 2015. Retrieved October 3, 2015. ^ Jeff Korbelik / Gzo (July 3, 2009). "Larry the Cable Guy still has hometown pride". Journalstar.com. Retrieved June 9, 2011. ^ Ernst, Douglas (October 7, 2016). "Larry the Cable Guy breaks Army vet's humerus while arm wrestling: 'I'm retiring from arm wrestling after this'". Washington Times. Retrieved January 25, 2018. ^ Huff, Steve (October 8, 2016). "Arm-Wrestling Larry the Cable Guy". Maxim. Retrieved January 25, 2018. ^ Matteson, Cory (March 30, 2017). "Larry the Cable Guy recounts arm wrestling that went awry". Journal Star. Lincoln, Nebraska. Retrieved January 25, 2018. ^ Taylor, Gary. (September 26, 2010) Larry the Cable Guy gives , million to hospital – Orlando Sentinel. Retrieved on 2012-07-23. ^ Ullman, Ethan (March 24, 2010). "Interview with comedian Lewis Black - Albany Student Press - University of Albany" Check |archiveurl= value (help). Albany Student Press. Archived from the original on February 3, 2014. ^ "Law and Disorder". Discogs. Retrieved August 1, 2013. ^ "Salutations and Flatulations". Discogs. Retrieved August 1, 2013. ^ "American album certifications – Larry the Cable Guy – The Right to Bare Arms". Recording Industry Association of America. If necessary, click Advanced, then click Format, then select Album, then click SEARCH. Wikimedia Commons has media related to Larry the Cable Guy.